Keeper Tim Fitch set Redditch Entaco on their way to victory at OEs. Picture by Marcus Mingins. 2518007MMR3. 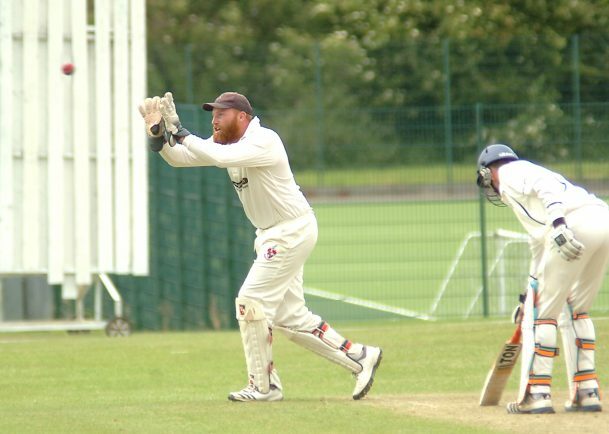 REDDITCH Entaco continued their resurgent form to move into fourth place in Birmingham League Division Three thanks to an impressive 101-run victory at Worcester outfit Old Elizabethans. After the visitors had chosen to bat, overseas wicketkeeper Tim Fitch inspired an excellent Kingfishers recovery from 35-4 thanks to a gritty knock of 72. There was able support from opener Rizwan Mohammed with 42 before Haris Ali made a crucial 48 in the lower order to lead Redditch to a solid 224-8 off their 55 overs. Once the visitors had the ball in their hand, their total always looked likely to be enough to secure victory and this proved to be the case as wickets tumbled at regular intervals. Only one OEs batsman made 20 or above and their paltry total of 123 all out inside 38 overs would have been far worse had it not been for 35 extras including a disappointing 20 wides. Ghulam Moyhuddin continued his hot streak with 4-45, Haleem Basharat took a highly impressive 3-13 and Ali claimed 2-23. Redditch welcome sixth-placed Old Hill to Bromsgrove Road on Saturday. The outcome was reversed in the 2nd XI fixture as visitors OEs won by seven wickets. Redditch made a positive start thanks to Nick Fowkes (44), Naseek Hussain (45) and Faizan Ahmed (52no) but, despite being boosted by 40 extras, the innings subsided to 209-9 off 50 overs. This was never going to be enough with opener Chris Pearman (103) in such fine form and the visitors reached 211-3 with an over to spare. Fourth-placed Redditch Entaco continue their 2nd XI Division Two South campaign at Berkswell on Saturday.